Alfred studies Robotics at University of Plymouth, but spent his teenage years in Iceland before moving back to the UK for his studies. Outside of his studies, Alfred is a keen powerlifter and a coffee enthusiast, and has even found time to co-found his own start-up business, Access Robotics LTD.
Alfred came up with a design for a wheelchair mounted robotic arm, to make the lives of people who are dependent on wheelchairs easier. The aim is that the arm will help them reach areas which they might depend on a caregiver for. The proposed project is my dissertation for the 3rd year of a Robotics undergraduate course at the UoP. 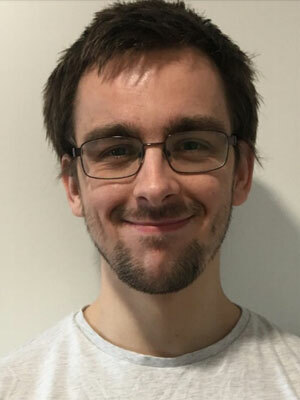 I am the co-founder of a start-up, Access Robotics LTD, which is currently aiming to commercialize this project with the help of a feasibility grant that has been provided by Creative England’s “E-health Productivity & Innovation in Cornwall” (EPIC) initiative. The aforementioned grant is strictly used to assess and evaluate the feasibility of the project outlined in this competition entry-form. The proposed project is a cable-driven, 3D-printable, modular, low-cost, and soft-robotic Wheelchair-Mounted Robotic Arm (WMRA). WMRAs are designed to handle simple pick-and-place tasks, and they have the potential to greatly improve the autonomy and quality of life for wheelchair users with upper-limb mobility issues who require the assistance of a caregiver to perform Activities of Daily Life (ADLs), such as opening doors, holding beverages, retrieving dropped items, and other such tasks that are fundamental to daily life. An affordable WMRA can potentially enable users to carry-out 40% more ADLs autonomously, and consequently require 30% less assistance from a caregiver. Offloading these trivial tasks from the caregiver enables them to focus on the more important and demanding aspects of their job: the emotional and physical well-being of the person they are caring for. Anyone who can operate the joystick on an electric wheelchair can potentially benefit from this product. Service-users with more severe cases of immobility could also benefit, but this would possibly require further exploration into Human-Machine Interfaces (HMI) other than joysticks, depending on the specific nature of their ailment. For example, a study conducted by Jae-Woon Min et al explores the use of cost-effective shoulder and head interfaces for powered wheelchair control. The aim is to have the overall cost below £2,500 in order to keep the arm affordable. 3D printing is very cost-effective for rapid-prototyping, but larger scale-production would see further cost-reduction benefits if manufacturing techniques, such as plastic-molding, are used once a final design is settled on. The motors currently used are quite cost-effective, but feasibility testing might indicate that more powerful motors are needed at the base of the entire arm to support the payload, whilst the intermediate motor-arrays on each segment would be used to define the pose of the end-effector. Relying on others to carry-out basic tasks is frustrating, depressing, and expensive; particularly as the result of unforeseen circumstances wherein there isn’t much time adapt to a sudden degradation in mobility. Over the past few years, one-in-five people in the UK reported a disability, and the top three most common impairments reported were issues related to mobility, fatigue, and dexterity. An affordable, reliable, and indeed useful WMRA has the potential to massively improve the quality of life for individuals with upper-body mobility issues by boosting their autonomy, and by extension, their accessibility to the outside world. Furthermore, given that the proposed system is a robotic arm, it can be applied to various other fields such as search-and-rescue, automated agriculture, hazardous-material handling, and teleoperation, just to name a few. Developing a device that can diversify across different sectors with only a few design tweaks will make for a more commercially viable product. 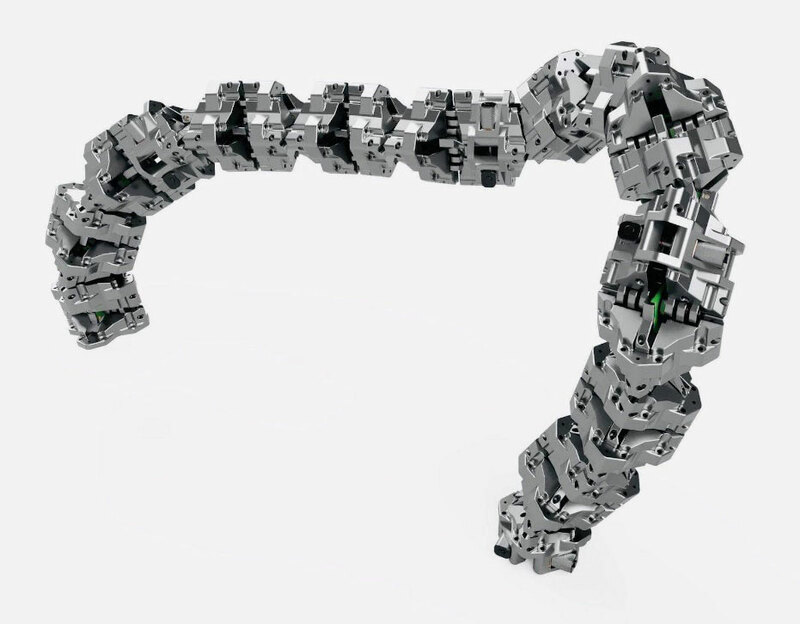 The final WMRA will consist of a series of segments that are attached together, end-to-end: this kind of modularity would allow for different types of segments to be easily implemented, as well as for different length arms to be built. Four small motors are placed at the base of each segment, and each motor shaft has a separate cable connected to it. These cables are each fed through separate internal channels, and then affixed to the far end of the segment. So when a motor pulls on its respective cable, the segment will tend towards that direction; consequently, the segment will “curve” along a resultant path that is due to a combination of force-vectors induced by adjacent motors. The motors used have gearboxes with a high reduction ratio, so their shafts rotate quite slowly and generate a large amount of torque– this makes the robot safer to use and also capable of handling meaningful payloads at the end-effector. A single segment consists of 6 revolute joints, and each joint is offset and rotated orthogonal to the one before it. Absolute rotary magnetic encoders are installed into each joint and connected via an I2C interface. These sensors are connected in series and provide feedback information to a microcontroller so that the exact pose (position + orientation) of the segment is always known. Is there something similar that can be improved & how is this design different from others on the market? At present, WMRAs are an expensive scarcity: and with a minimum cost of >$15,000 for one that’s commercially available, this isn’t very surprising. There are research projects such as DORA (Door Opening Robotic Arm) and the R-ARM (costing $2,000 and $5,000, respectively) that would be affordable alternatives, but unfortunately, these systems don’t appear to be commercially available. WMRAs presently on the market are “rigid” robots that utilize expensive hardware. These rigid robots are ideal for industrial automation as they offer high degrees of precision that are ideal for assembly lines, but they are not inherently safe to operate around people (without the extensive implementation of costly active control systems) and are not necessarily robust towards collisions due to a lack of passive compliance. The proposed WMRA will be a “soft” robotic system incorporating visco-elastic tendons, such as those used by the GummiArm7 robotic research platform, for variable-stiffness capability. This will make the system more difficult to damage and safer to use around people as it can be made passively compliant very easily. The proposed project will be built from Fused Deposition Modeling (FDM) 3D printable parts (reducing the cost significantly, and also making the system a viable open-source project that could benefit from research collaboration). Similar to other commercial WMRAs, the target payload-capacity is 1-3kg, and the workspace (range of influence) will be at least 1m. Furthermore, this project will rely heavily on user-centered-design, whereby successive design iterations will be guided by feedback from service-users provided by institutions such as disability Cornwall: who will be awarded the first successful end-product pro gratis.